As the motorcoach pulled out of Florence, I was on my way for the first time ever for a day excursion al mare. In years gone by, I have vacationed on idyllic isolated stretches of southern Italian beaches and isles as an American tourist. Today was my first time going to the beach as a day-tripper to escape the "heat" from everyday life in Florence and the nerve-wrecking turmoil exploding in the global financial markets. "Quando il mare è in tempesta, restate sulla spiaggia. Starsene tranquillo in vacanza". While reading this bit of advice in the financial section of yesterday's La Nazione, I was convinced that the moment was calling me. As much as I heretofore have always avoided participating with the droves of Italians who, every August, ritualistically abandon their jobs and their cities to partake in the frantic mass exodus to the coast, I desperately needed to "go fishin", both literally and figuratively. And after a relaxing 2 hour motorcoach drive, I found myself "nel posto giusto, al momento giusto". 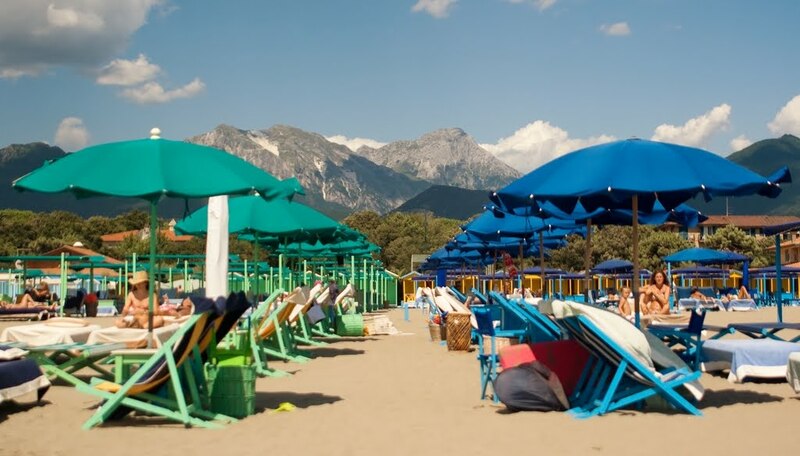 At the seaside resort of Forte dei Marmi, in the Tuscan province of Lucca, with a striking view of the magnificent white marble mountaintops of Massa-Carrara in the background. As the world awaited the final official word on the state of the global credit wreckage from "La Casa Bianca", I exhaled and turned off my IPhone. However, the allure of drenching myself in saltwater until my limpid body and brain floated away with the tide was beyond enticing. After 3 years of summers spent innocently, lovingly, and secretly discovering the real Florence in its strange and solitary August emptiness, it was time to consider myself a budding member of the mad Italian masses. I decided to bolt for the coast, if only for one day, just to be safe. On the advice of other Florentines, I took the coach to Forte dei Marmi instead of the train to Viareggio and went on a Monday, to avoid the "bollino nero". Never having done this before, I didn't know how the beaches worked. From the window of the coach I saw hundreds of "bagni". These are beach-side establishments with low-profile Laguna Beach type exteriors hidden by lush bouganvilla and palm trees, where you pay an annual fee for your own designated spot on the sand with an ombrella, table and lounge chairs. A restaurant, bar, showers and bathrooms are incuded. If you go just for the day, you can rent a spot if available. I walked into the first bagno I saw and asked for a spot vicino al mare. After paying for my assigned spot, the manager escorted me to my private little front-row piece of paradise where I spent the day relaxing and observing the Italian way of spending a day at the beach. There were some things I liked and others that I did not like. However, overall, it was more than just a beautiful day at the beach....it was amusing. Each bagno is like its own private piazza on the beach. You choose which bagno you like the best, according to its personality and reputation. Families and friends go to the same bagno, year after year. The one I went to felt like a tiny neighborhood. Everyone knew everyone but me. The advantages of this system are many. It's like home away from home. You can leave your personal belongings and valuables at your chair when taking a dip, without worrying that they will be stolen, because each bagno has its own heart-attack gorgeous male bagnoguarda, the guard who looks after the bagno. The sand is perfectly manicured, everything is meticulously clean and orderly. Each bagno has its own raised walkway leading to the water, so you don't have to burn your soles on the sand when headed for a dip. In between extended dips in the warm, calm caressing water, I spent the day mostly observing others as they carried on their customs at the bagno. I was not surprised to see a chocolate colored mass of bodies baking their brains out in the sun, turning over at precisely timed intervals while checking out their tan lines. From this respect, it was like the Jersey Shore of the early '70's. A feature of this particular bagno was posted on a sign in the bar. They will send you a free SMS when it is time for you to turn over to keep an even tan. Because I spend so much time in the sun on my bike, I inadvertently have a tan by anybody's standards, but felt like a self-conscious pathetially pallic China Doll amid the shiny black lacqured bodies surrounding me. The funniest thing of all, was the woman sitting across from me. Every time I looked up at her, she was wearing a different bikini. I counted a total of 5 during the day. She never got wet, spent the whole day on the phone smoking cigarettes and getting annoyed when a speck of sand landed on her foot. At 13.00, almost the whole beach got up and walked away. I wondered where they had gone until the salty scent of zuppa di vongole permeated the air. They had all retreated to the bagno's restaurant for a 3 hour lunch where they ate spaghetti alle vongole, wine and other frutti di mare. There were others who couldn't resist the best tanning hours of the day.....they ate mozzarella balls, plump green olives and panini out of their beach bags. I was compelled by curiosity and the smell of clams to take my own pranzo, while watching the priceless scene of chatter, digestion and re-digestion, followed by a hand of cards and a shot of espresso. Then they all headed back to their assigned spots for Chapter Two of a day al mare. In the afternoon I walked south along the water observing other bagni. It was a gorgeous day. Although I tried to read my most recent book, The Rise and Fall of the House of Medici, I felt too far away from Florence for it to be relevant. The day passed quickly and before I knew it, I was on the motorcoach, passing the beach town of Viareggio, which in comparison to Forte dei Marmi, reminded me of Asbury Park. Which made me miss the sounds of the arcades and the smell of cotton candy, hot giant pretzels, cheeseburgers and French Fries at the Jersey Shore.